Rev. Mary Love of Crescent Hill Presbyterian Church speaks to demonstrators on the steps of the Kentucky Capitol building on Tuesday. In September, a group of Roman Catholic nuns successfully persuaded the companies building an underground gas pipeline through Kentucky to reroute the project to avoid their land. But the nuns aren’t stopping there. 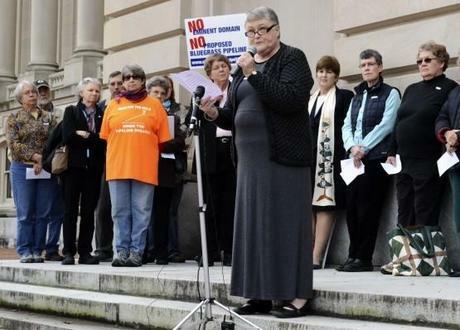 On Tuesday, about 50 religious protesters, including nuns from the Sisters of Loretto and members of Kentucky Baptist, Presbyterian and Unitarian churches traveled to the Kentucky capitol to deliver a 36,250-signature petition against the Bluegrass Pipeline to Gov. Steve Beshear’s office. The religious leaders used Biblical imagery to speak out against the pipeline — a project that David Whitlock, pastor of Lebanon Baptist Church said would mar God’s land. “I am here because I believe, as the Psalms express, that the whole Earth is full of the steadfast love of God,” Susan Classen, co-member of the Sisters of Loretto said Tuesday. “It matters how we treat the Earth, the land, the water and all inhabitants of the Earth.” Earlier this year, the nuns of Sisters of Loretto and the monks of the Abbey of Gethsemani refused to allow Bluegrass pipeline workers to survey their property — which, between the two religious communities, amounts to more than 3,000 acres that they’ve owned since the 1800s. In September, a representative of Williams Co., the company which, along with Boardwalk Pipeline Partners, is building the Bluegrass pipeline, confirmed that the pipeline would not go through the religious communities’ property. The nuns, however, promised to continue to fight the pipeline, saying the fight wasn’t about them, but about ensuring the environment isn’t abused for the sake of profit. The 500-mile pipeline is projected to run through 13 counties in Kentucky, carrying 200,000 to 400,000 barrels of natural gas liquids each day. The pipeline will start in West Virginia and Ohio (joining at the beginning of another not-yet-constructed pipeline in Pennsylvania) and will carry natural gas throughOhio and Kentucky, joining up with existing pipelines throughout the Southeast to end at the Gulf Coast. Gov. Beshear did not meet with the religious protesters, but released a statement on the project Tuesday. Besides the Kentucky nuns, other religious leaders and groups have been ramping up their climate and environmental activism this year. In July, a group of evangelical scientists sent a letter to Congress calling for more climate and environmental protections. And the nonprofit New Evangelical Partnership for the Common Good (NEP) released a video in October that urges the Obama administration to protect more of America’s wild places rather than continuing to open more and more of them up to drilling.